Help Ariel Goldember, An Actor With Down Syndrome, Meet Sean Penn! You are here: Home / Resources / Help Ariel Goldember, An Actor With Down Syndrome, Meet Sean Penn! Be sure to hit the play button above to watch the video and hear more about Ariel’s inspiring dream to meet Sean Penn! 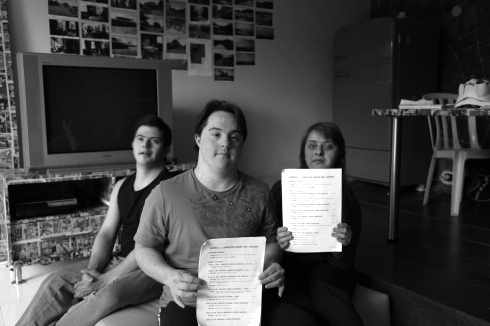 Colleagues (Buddies) tells the story of three young people with Down syndrome who love movies and video work at the library of the institution where They have always lived in. One day, inspired by the film “Thelma & Louise” They decide to run away using the gardener’s old car to have a freedom experience. They travel to uncommon places in search for three simple wishes: Stalone wants to see the sea, Annie looks for a husband and Marcio needs to fly. During this search, They embark on Several adventures as if life was just a children’s play. Ariel Goldemberg and his two friends hold up their scripts! Anything’s Possible When The Internets Involved. “Colegas (Buddies)” is going to premier in Brazil on March 1st, and Ariel’s dream is to get Sean Penn to attend the screening. Although it seems like an impossible feat, I’ve learned the internet is a very powerful place where anything is possible. There’s already a lot of social media buzz around this film, and Ariel’s dream. The YouTube trailer already has over a million views, and their hashtag, #VEMSEANPENN, is being tweeted, and retweeted all across the Twittersphere. 2 Easy Ways You Can Help Ariel Goldembeg Accomplish His Dream Of Meeting Sean Penn! 1. Simply click on all the share buttons at the top / bottom of this post. Share it on Facebook, tweet it on twitter, Pin it on Pinterest, email it to your friends, blog about it and link to this post…in other words share, share, share! There’s power in numbers, and the more people who share this post, the greater the chance the right person sees it. 2. Email this post to your local news station, CNN, Headline News, afternoon talk shows, The Today Show, Good Morning American, etc….Again, the more people who know (and report) about this story, the greater the chance Sean Penn sees it, and responds. As a father of a child with Down syndrome I think this is an awesome story and I want to help get the world out any way I can! As I mentioned, the internet is a pretty powerful place, and there is great power in numbers. We have a large community of readers and if everyone takes a second to share this story we can really help get this story out there! What do you think of Ariel’s dream? Leave a comment and let us know! Also leave a comment and let us know if you helped us spread the word!